I have been blogging for years, often stuck in front of the computer nearly all my waking hours, and perhaps should take a break. I have been to Thailand, Indonesia, Belgium, Netherlands, France, United Kingdom, Germany, Switzerland, Italy and United States of America, but that was 20 to 30 years ago. I went back to Geneva, Switzerland, for the Geneva International Invention Exhibition a few years ago. Maybe it is time to do a bit of traveling again, and this time, for a real vacation. Where should I go? Well, I understand that New Zealand is a pretty unique place. It was the last place on earth to be populated by human, do not have any man-eating animals, no snake (wonder if they have rats), and have some very unique animals, birds, fauna and flora. I would love to see that fierce looking Maori warrior sticking his tongue out at me. Plus I think I would enjoy the mild temperate maritime climate as a welcomed change from the hot and humid tropical weather in my country. 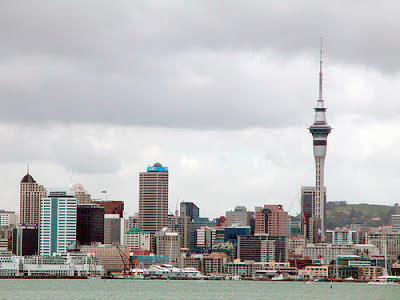 The largest city in New Zealand is Auckland, in the North Island of New Zealand. Plus lots of events are hosted in Auckland year round. An example is the Waitakere World Junior Badminton Championships 2007 which will be held between 25 October - 4 November this year. My country, Malaysia, will be among the many teams from twenty-six countries competing for titles. Others include other Asian badminton powerhouses China, Korea and Indonesia. I should be there to cheer the Malaysian team to victory. Then there is this interesting "The Pride of Auckland", world famous sailing and dining cruises with daily scheduled cruises, regattas, match racing and sailing events for groups of any size. There will be informative commentary on the sights of Auckland’s beautiful Waitemata Harbour by the crew. Not only that, guests are welcomed to help sail the yachts and as a bonus, guest gets free entry to the New Zealand National Maritime Museum. And the cost? From $48.00 per person only. But I am, sad to confess, a cheapskate. I use all free tools like the free and very good Irfanview photo editor (click BACK button to get back to this page) together with Paint that comes with Windows for the screenshots for my blog. I use blogspot.com exclusively for all my blogs and never use custom domain. For reasons, have a look at Why I never use New Blogger custom domain. For photos for my posts, I either use my own photos or those photos uploaded to Flickr under the Creative Commons license (I would of course give attribution to the source plus inform the owner of the photos). The above photo is an example and as soon as I have published this post, and have the post URL, I will inform Beau Wade about this post. I use the free BlogColletor Lite to make a downloadable PDF file of my blog to sell for $1.99????? at PDF book Blogger Tips and Tricks for sale online. Didn't expect to sell any, but to my surprise, I sold one!!!! If you want the story, you will have to surf to my "e-Commerce" post above to read about it. Hope you will buy one too, but read the update carefully. Now knowing my cheapskate nature, don't be surprised that if I really take a break from this addictive blogging hobby, I would go for Auckland Accommodation which gives a Lowest Rate Guarantee. The guarantee says that if I can find a rate lower than the best available Internet rate on another web site for the same hotel/accommodation on the same dates, all I need to do is to inform them within 24 hours of booking and we will honor that rate for the night(s) for which the lower rate was found and refund me the difference. Now for a cheapskate like me, that is very comforting. I may even go extreme and go for Auckland Central Backpackers. After all, I bought Peugeot alloy light-weight racing bike from the flea market for a song when I was in Geneva for the Geneva International Invention Exhibition, stayed in a caravan by the Geneva lake far from the city center, cycled around Geneva and saved enough on bus fares to cover the cost of the bike, spent less than what I was given and took home a bonus plus had a real jolly time. If I can do that in Geneva, I may be able to do something like this in Auckland too. Only trouble is, no one is going to sponsor me for my proposed break from blogging in Auckland. Any offers?